8 — 2 Irwin/Mc. Graw-Hill ©The Mc. 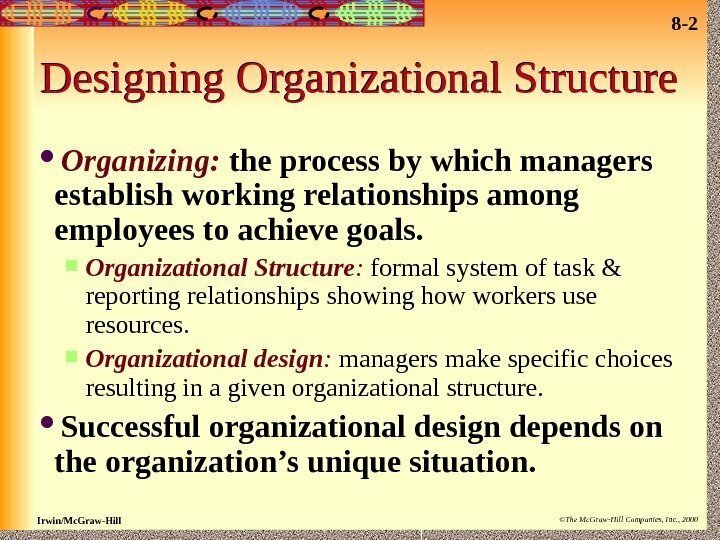 Graw-Hill Companies, Inc. , 2000 Designing Organizational Structure Organizing: the process by which managers establish working relationships among employees to achieve goals. 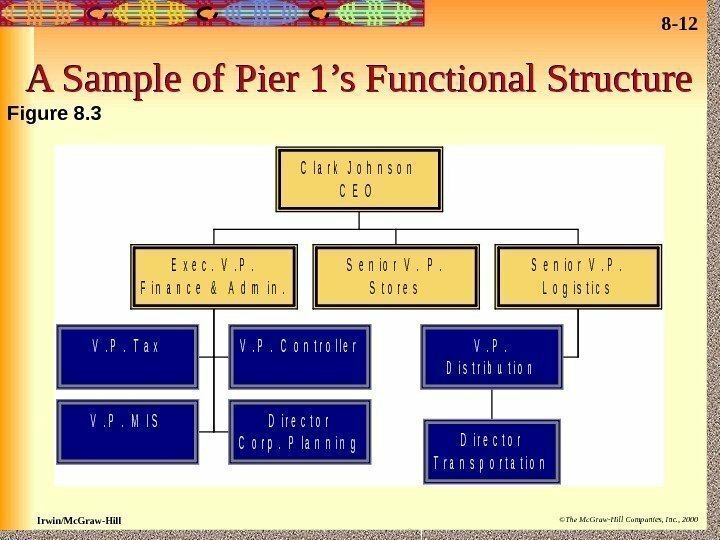 Organizational Structure : formal system of task & reporting relationships showing how workers use resources. Organizational design : managers make specific choices resulting in a given organizational structure. Successful organizational design depends on the organization’s unique situation. 8 — 3 Irwin/Mc. Graw-Hill ©The Mc. 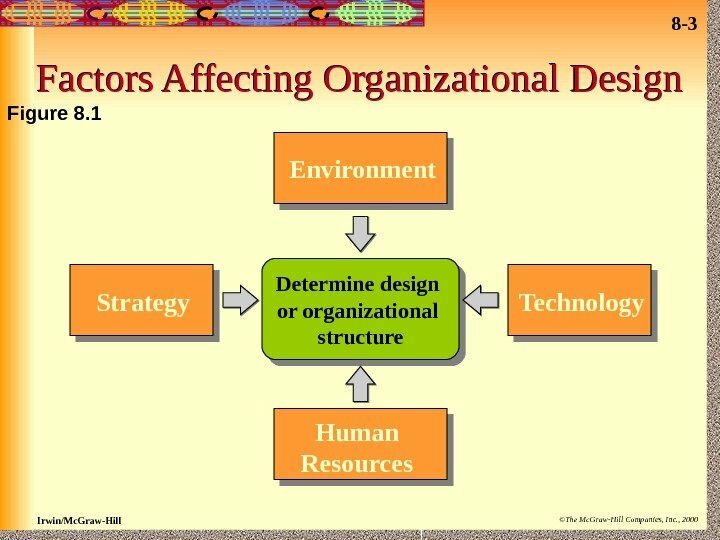 Graw-Hill Companies, Inc. , 2000 Factors Affecting Organizational Design Environment Strategy Human Resources Technology. 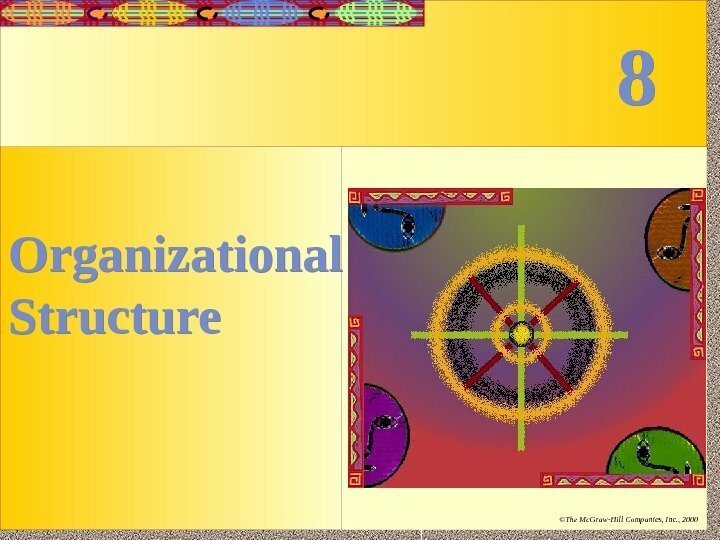 Determine design or organizational structure. Figure 8. 8 — 4 Irwin/Mc. Graw-Hill ©The Mc. 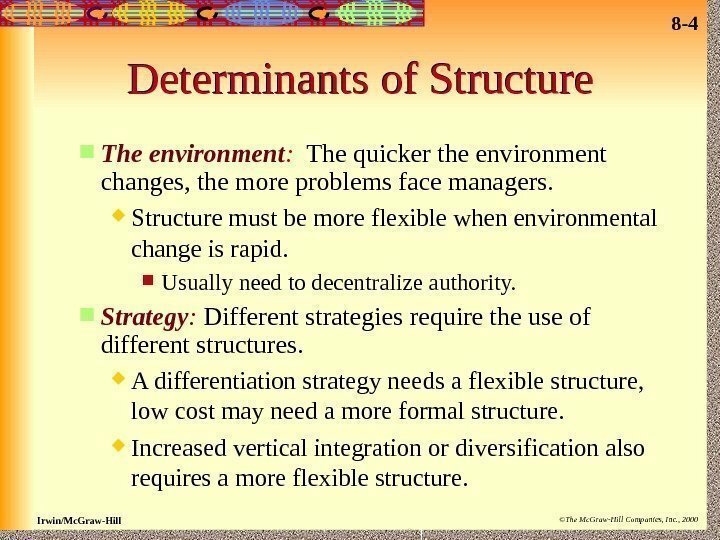 Graw-Hill Companies, Inc. , 2000 Determinants of Structure The environment : The quicker the environment changes, the more problems face managers. Structure must be more flexible when environmental change is rapid. Usually need to decentralize authority. Strategy : Different strategies require the use of different structures. A differentiation strategy needs a flexible structure, low cost may need a more formal structure. Increased vertical integration or diversification also requires a more flexible structure. 8 — 5 Irwin/Mc. Graw-Hill ©The Mc. 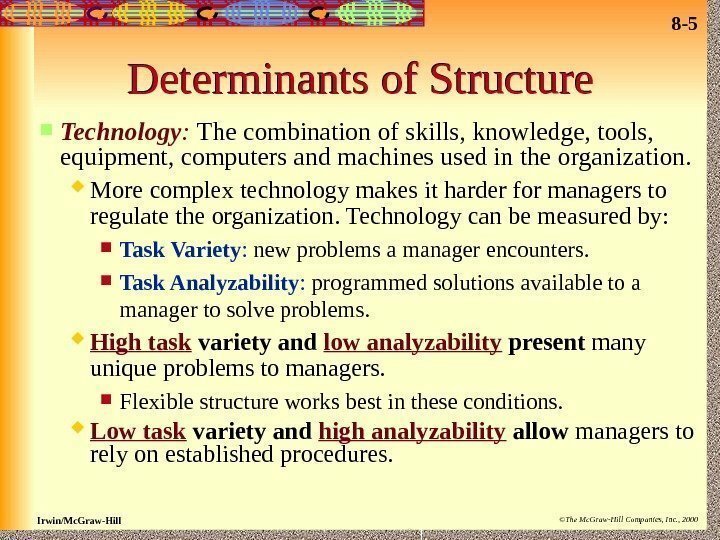 Graw-Hill Companies, Inc. , 2000 Determinants of Structure Technology : The combination of skills, knowledge, tools, equipment, computers and machines used in the organization. More complex technology makes it harder for managers to regulate the organization. Technology can be measured by: Task Variety : new problems a manager encounters. Task Analyzability : programmed solutions available to a manager to solve problems. High task variety and low analyzability present many unique problems to managers. Flexible structure works best in these conditions. Low task variety and high analyzability allow managers to rely on established procedures. 8 — 6 Irwin/Mc. Graw-Hill ©The Mc. Graw-Hill Companies, Inc. , 2000 Technology & People Small Batch Technology : produces small quantities of one-of-a-kind products. Based on the skills of the workers who need a flexible structure. Mass Production Technology : automated machines make high volumes of standard products. Workers perform repetitive tasks so a formal structure works well. 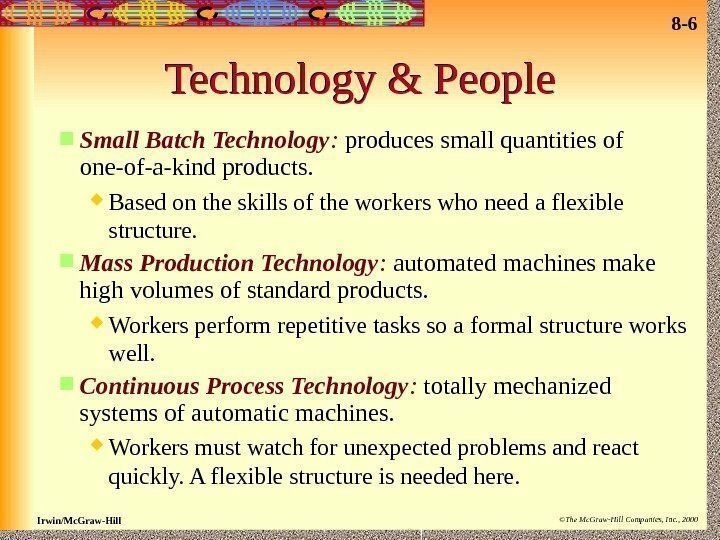 Continuous Process Technology : totally mechanized systems of automatic machines. Workers must watch for unexpected problems and react quickly. A flexible structure is needed here. 8 — 7 Irwin/Mc. Graw-Hill ©The Mc. 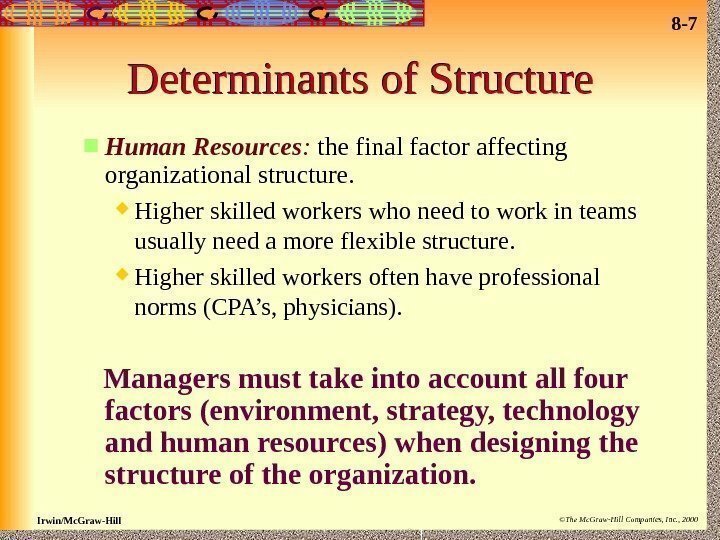 Graw-Hill Companies, Inc. , 2000 Determinants of Structure Human Resources : the final factor affecting organizational structure. Higher skilled workers who need to work in teams usually need a more flexible structure. Higher skilled workers often have professional norms (CPA’s, physicians). Managers must take into account all four factors (environment, strategy, technology and human resources) when designing the structure of the organization. 8 — 8 Irwin/Mc. Graw-Hill ©The Mc. 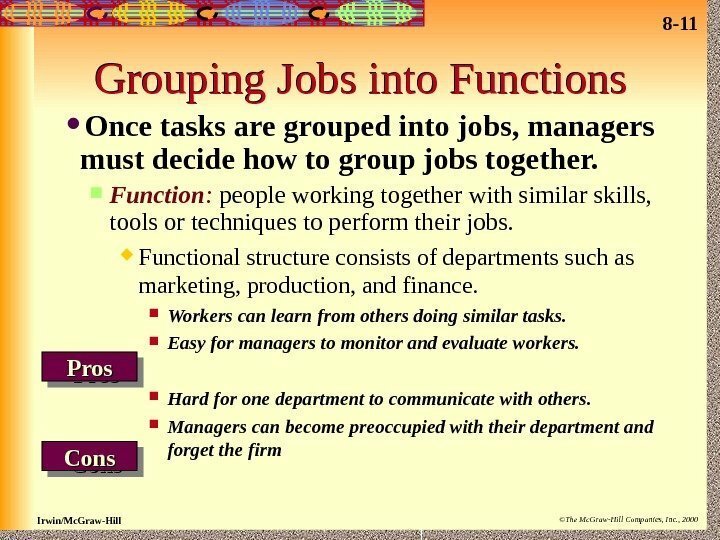 Graw-Hill Companies, Inc. , 2000 Job Design: group tasks into specific jobs. Results in a division of labor between workers that is effective and efficient. 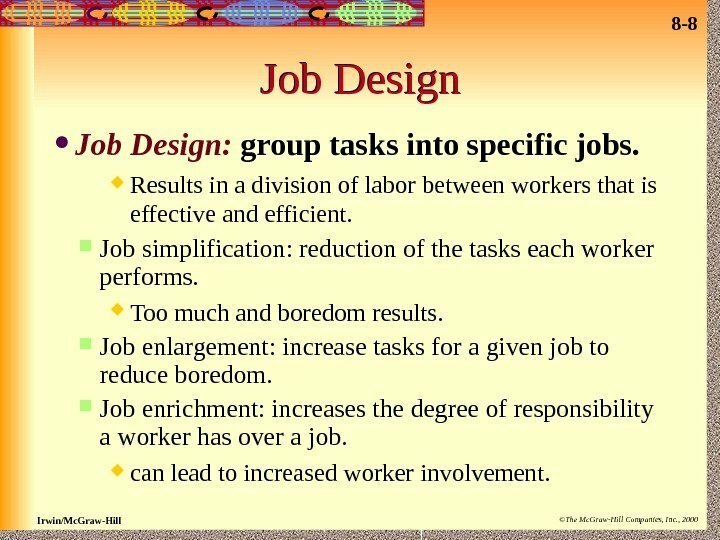 Job simplification: reduction of the tasks each worker performs. Too much and boredom results. Job enlargement: increase tasks for a given job to reduce boredom. Job enrichment: increases the degree of responsibility a worker has over a job. can lead to increased worker involvement. 8 — 9 Irwin/Mc. Graw-Hill ©The Mc. 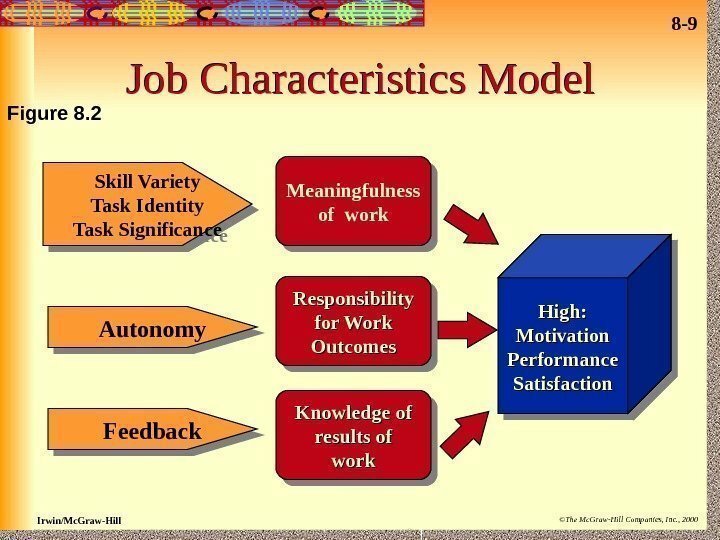 Graw-Hill Companies, Inc. , 2000 Job Characteristics Model Skill Variety Task Identity Task Significance Autonomy Feedback Meaningfulness of work Responsibility for Work Outcomes Knowledge of results of work High: Motivation Performance Satisfaction. Figure 8. 8 — 10 Irwin/Mc. Graw-Hill ©The Mc. 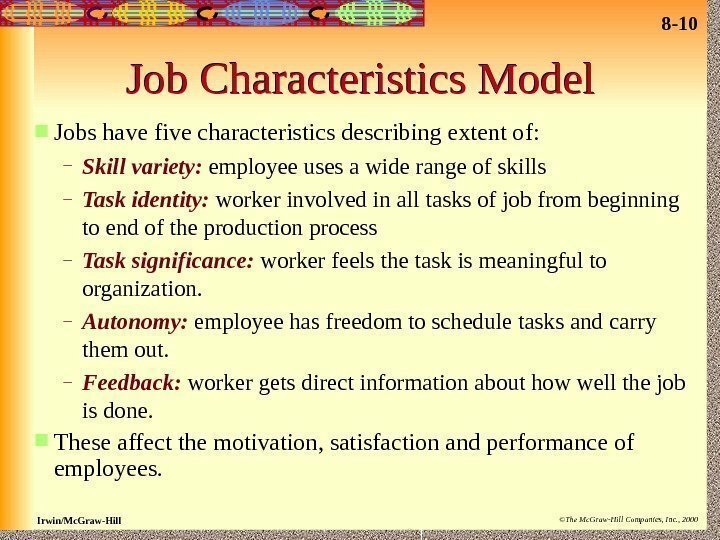 Graw-Hill Companies, Inc. , 2000 Job Characteristics Model Jobs have five characteristics describing extent of: – Skill variety: employee uses a wide range of skills – Task identity: worker involved in all tasks of job from beginning to end of the production process – Task significance: worker feels the task is meaningful to organization. – Autonomy: employee has freedom to schedule tasks and carry them out. – Feedback: worker gets direct information about how well the job is done. These affect the motivation, satisfaction and performance of employees. 8 — 12 Irwin/Mc. Graw-Hill ©The Mc. Graw-Hill Companies, Inc. , 2000 A Sample of Pier 1’s Functional Structure. V. P. T a x. V. P. C o n t r o l l e r V. P. M I SD i r e c t o r C o r p. P l a n n i n g E x e c. V. P. F i n a n c e & A d m i n. S e n i o r V. P. S t o r e s D i r e c t o r T r a n s p o r t a t i o n V. P. D i s t r i b u t i o n S e n i o r V. P. L o g i s t i c s C l a r k J o h n s o n C E O Figure 8. 8 — 13 Irwin/Mc. Graw-Hill ©The Mc. Graw-Hill Companies, Inc. , 2000 Divisional Structures A division is a collection of functions working together to produce a product. Divisions create smaller, manageable parts of a firm. Divisions develop a business-level strategy to compete. 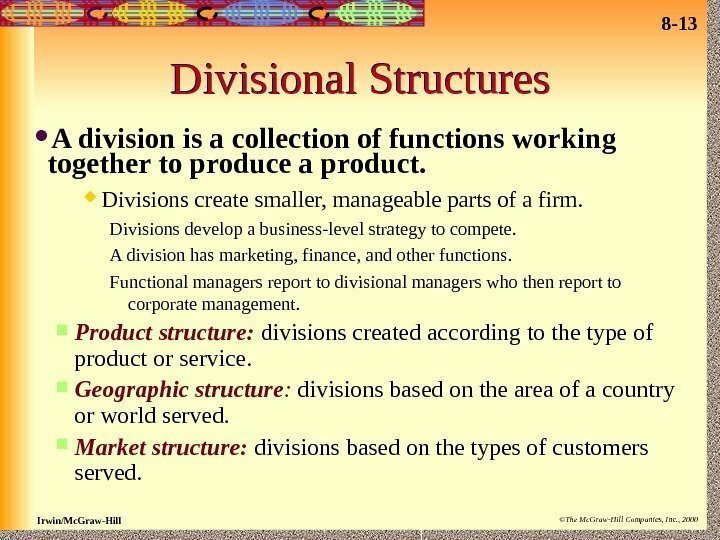 A division has marketing, finance, and other functions. 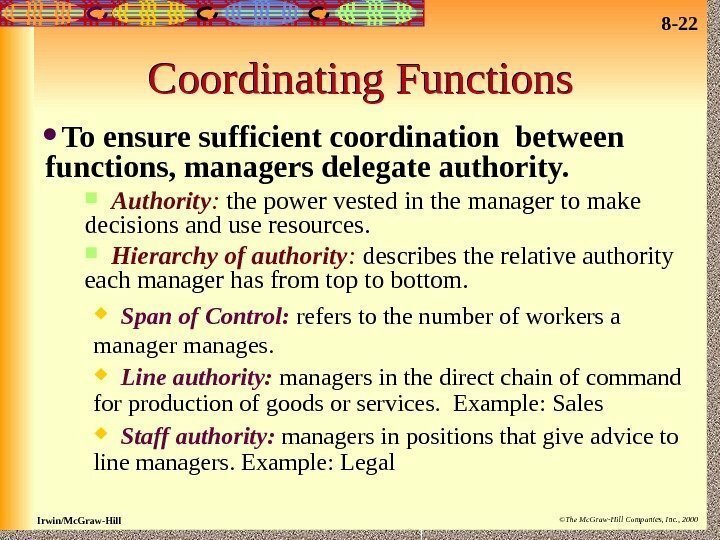 Functional managers report to divisional managers who then report to corporate management. 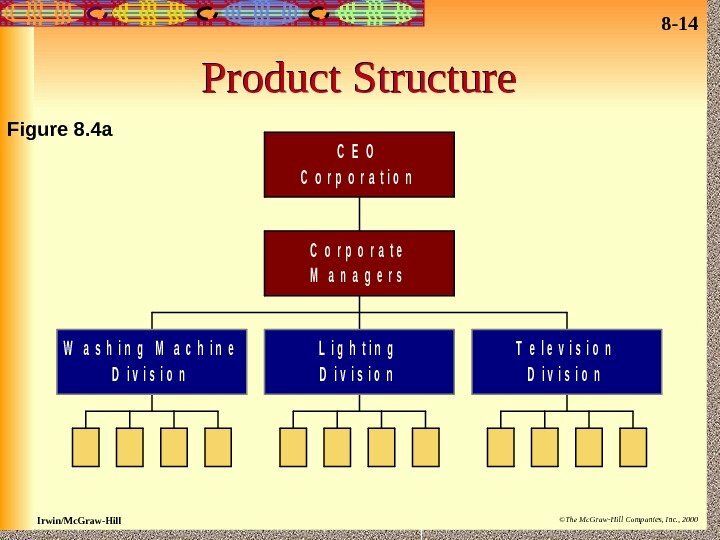 Product structure: divisions created according to the type of product or service. 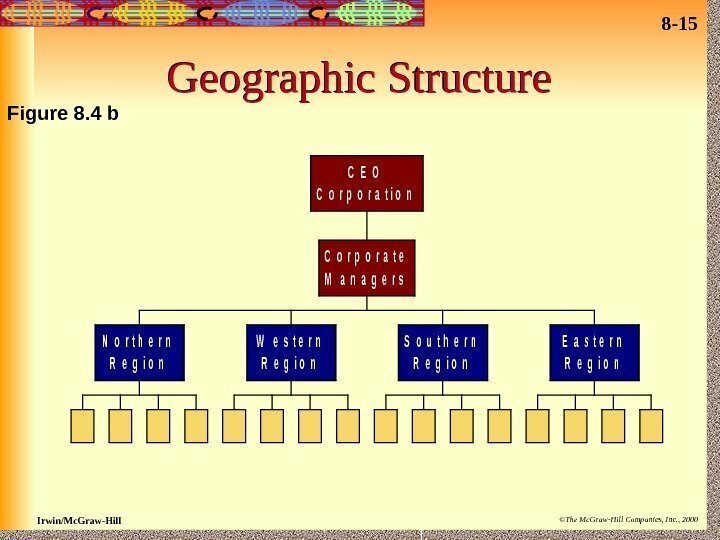 Geographic structure : divisions based on the area of a country or world served. 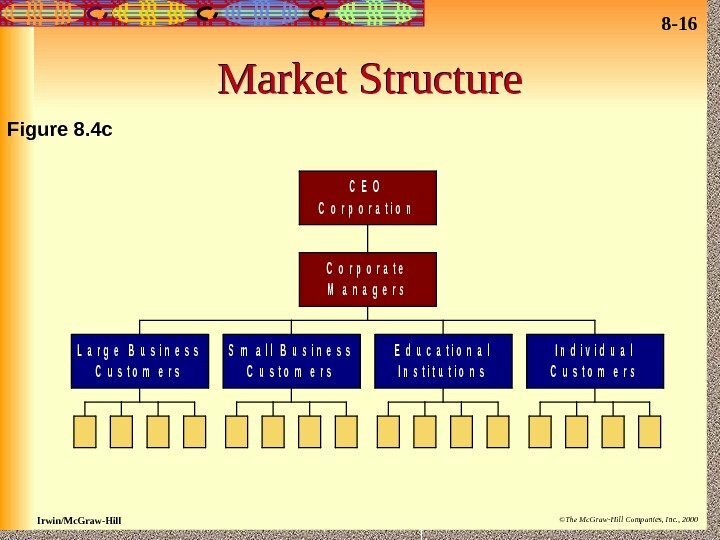 Market structure: divisions based on the types of customers served. 8 — 17 Irwin/Mc. Graw-Hill ©The Mc. Graw-Hill Companies, Inc. , 2000 Global Structures When managers find different problems or demands across the globe, global solutions are needed. Global geographic structure : different divisions serve each world region. For customer needs that vary between regions. 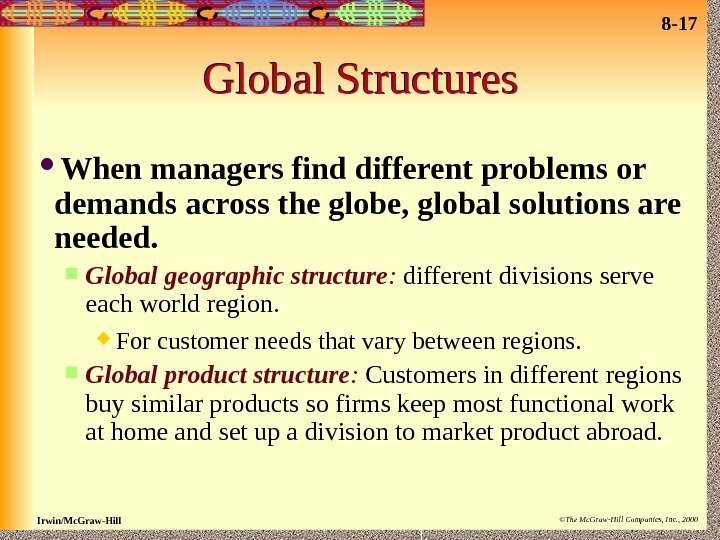 Global product structure : Customers in different regions buy similar products so firms keep most functional work at home and set up a division to market product abroad. 8 — 18 Irwin/Mc. Graw-Hill ©The Mc. 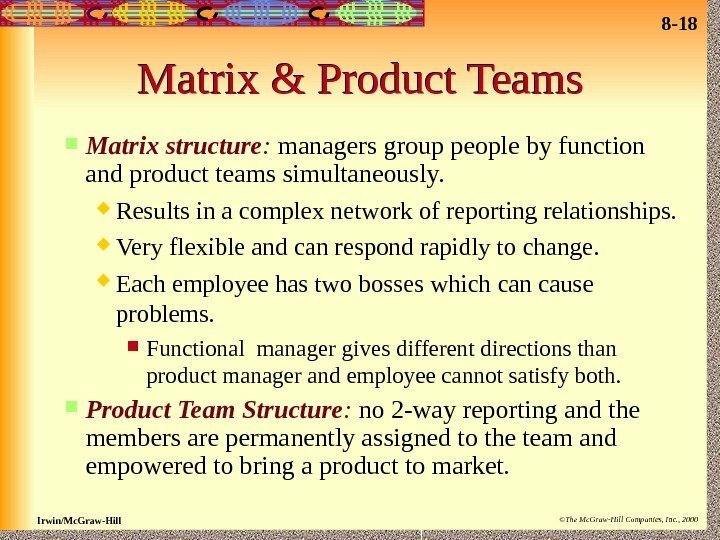 Graw-Hill Companies, Inc. , 2000 Matrix & Product Teams Matrix structure : managers group people by function and product teams simultaneously. Results in a complex network of reporting relationships. Very flexible and can respond rapidly to change. Each employee has two bosses which can cause problems. Functional manager gives different directions than product manager and employee cannot satisfy both. 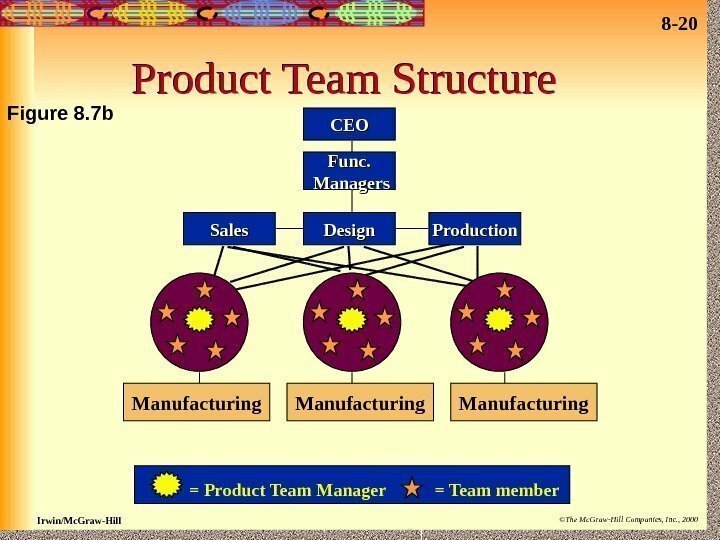 Product Team Structure : no 2 -way reporting and the members are permanently assigned to the team and empowered to bring a product to market. 8 — 21 Irwin/Mc. Graw-Hill ©The Mc. 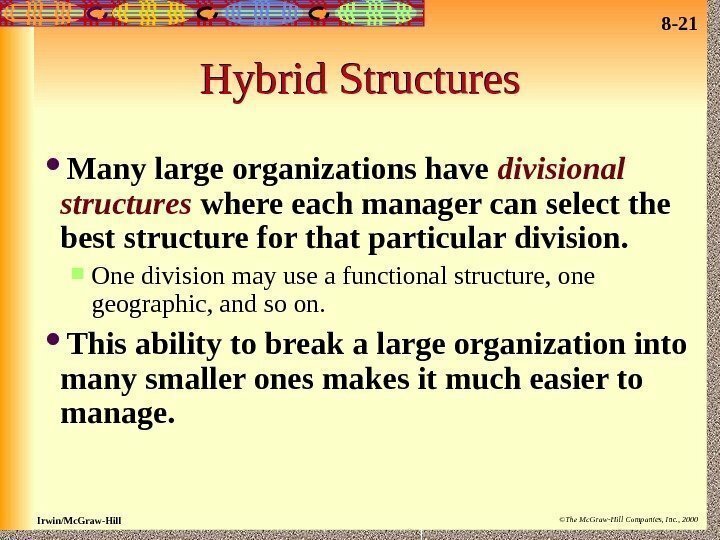 Graw-Hill Companies, Inc. , 2000 Hybrid Structures Many large organizations have divisional structures where each manager can select the best structure for that particular division. One division may use a functional structure, one geographic, and so on. This ability to break a large organization into many smaller ones makes it much easier to manage. 8 — 23 Irwin/Mc. Graw-Hill ©The Mc. 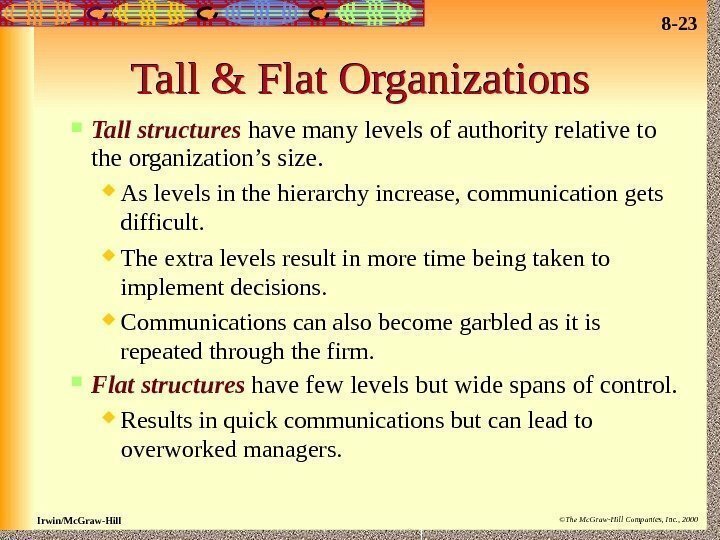 Graw-Hill Companies, Inc. , 2000 Tall & Flat Organizations Tall structures have many levels of authority relative to the organization’s size. As levels in the hierarchy increase, communication gets difficult. The extra levels result in more time being taken to implement decisions. Communications can also become garbled as it is repeated through the firm. Flat structures have few levels but wide spans of control. Results in quick communications but can lead to overworked managers. 8 — 24 Irwin/Mc. Graw-Hill ©The Mc. 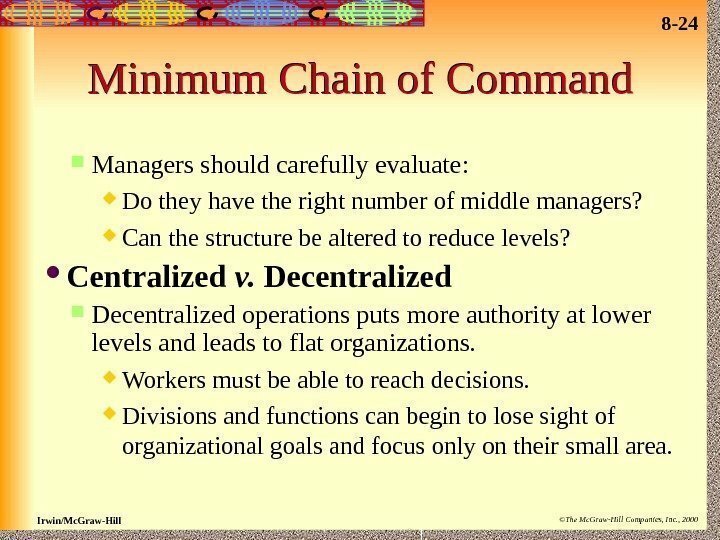 Graw-Hill Companies, Inc. , 2000 Minimum Chain of Command Managers should carefully evaluate: Do they have the right number of middle managers? Can the structure be altered to reduce levels? Centralized v. Decentralized operations puts more authority at lower levels and leads to flat organizations. Workers must be able to reach decisions. Divisions and functions can begin to lose sight of organizational goals and focus only on their small area. 8 — 25 Irwin/Mc. Graw-Hill ©The Mc. 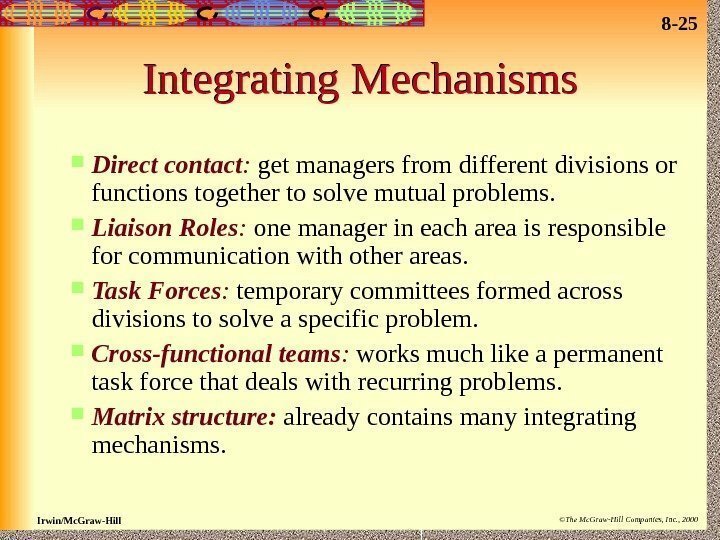 Graw-Hill Companies, Inc. , 2000 Integrating Mechanisms Direct contact : get managers from different divisions or functions together to solve mutual problems. Liaison Roles : one manager in each area is responsible for communication with other areas. Task Forces : temporary committees formed across divisions to solve a specific problem. Cross-functional teams : works much like a permanent task force that deals with recurring problems. 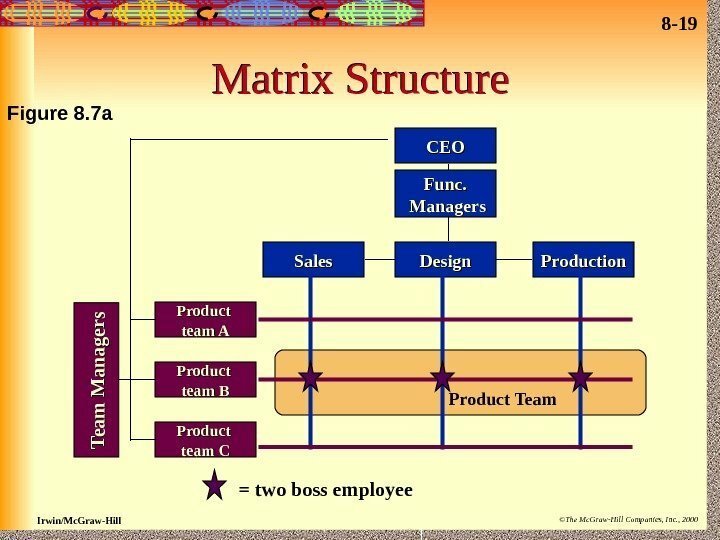 Matrix structure: already contains many integrating mechanisms. 8 — 26 Irwin/Mc. Graw-Hill ©The Mc. Graw-Hill Companies, Inc. , 2000 Strategic Alliances Strategic alliance: a formal agreement committing two or more firms to exchange resources to produce a good. 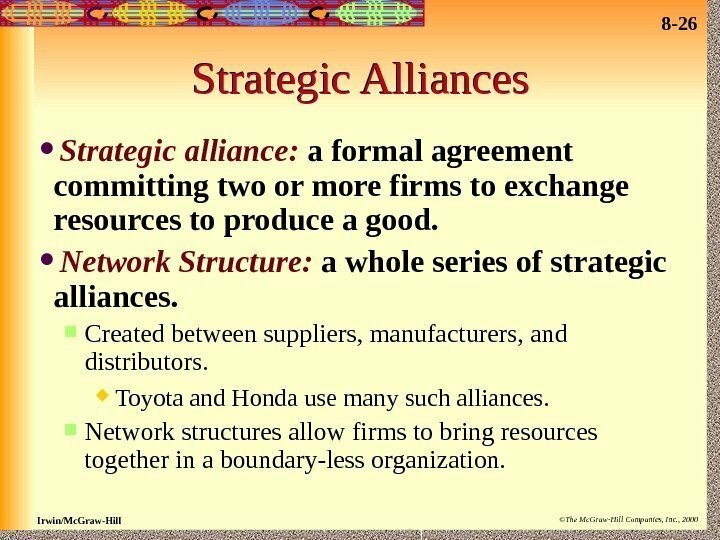 Network Structure: a whole series of strategic alliances. Created between suppliers, manufacturers, and distributors. Toyota and Honda use many such alliances. Network structures allow firms to bring resources together in a boundary-less organization.